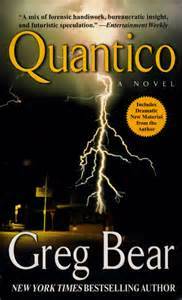 Quantico by Greg Bear. Vanguard Press. 327 pages. I know Greg Bear from his excellent science fiction books such as The Forge of God and Darwin’s Radio. And when I read on the dust jacket words such as “a near-future thriller,” it led me to believe that what I was getting was a semi-futuristic FBI story. It’s really not. But it is a good (not great) FBI story. One of the my other motivations is that a future writing project of mine involves the FBI, so there’s that too, but I still like a good story just for its own benefits. This one is about what they promote as “possibly the last class” to graduate from the FBI academy at Quantico, Virginia, but they don’t tell you why. Terrorism is rampant, much of it a carry-over from both 9/11 and a later event referred to as 10/4. Special Agent Erwin “Griff” Griffin is an experienced FBI agent investigating suspected terrorism in America’s heartland while his son, William Griffin, is trying to graduate from Quantico. A disaster occurs and their paths cross, which leads into a major conspiracy and a situation that threatens the whole world. Sound familiar? It’s a typical thriller, but Bear does something here that both intrigues me and annoys me. He writes his stories in such a cryptic way that I have a hard time keeping track of what’s going on; in other words, there is no explanation at all. I find myself on page 300 wondering how a character got to that point when I thought he was dead on page 200. I am sure his story described it, but often a scene happens suddenly without warning, and if you snooze, you lose. In one chapter, they were in a helicopter, falling asleep. Two paragraphs later, they were crashed, either dead or hiding from the enemy. Huh? The danger for a lot of the book is presented as anthrax, and at risk of sharing spoilers, that’s not the real danger. Well, yes, but…no. In any case, the book was just okay. It pushed all the technical buttons, but really didn’t have much soul. I didn’t end up caring about the characters, there wasn’t a lot of heart-stopping action, and not a lot of surprise. I give it two and a half stars out of five.